ST. GEORGE — The Utah Department of Transportation discovered ancient ruins this month as they paved their way through the Southern Parkway, a 33-mile project that will soon be an eastern belt route for Washington County. The ruins have been named one of the oldest sites investigated in Southern Utah, where more than 15 other archaeological sites have been found near Washington Dam Road. Scientists are currently stating, upon significant research, that the area was inhabited for up to 10,000 years. The Utah native Shivwits tribe was invited to the sites to search the ruins and members are working closely with archaeologists to properly preserve them. So far, among the list of items uncovered are Anasazi pit houses, arrowheads, pottery calibrated to have been dated as far back as 400 B.C. and dinosaur fossils. What the paleontologists are characterizing as 200 million-year-old fossils include teeth from nine species – three of which could be newly identified species – were also found during construction and have been archived for more research. “We are an organization that learns,” Dana Meier, project manager for UDOT, said. UDOT will continue to carefully navigate this project as they strive to protect the species in the construction area and within the ruins. The fifth pit-house was larger than the other four and contained dart points rather than arrowheads. Obsidian materials were found rather than quartzite and chert, and the hearth was composed of basalt boulders rather than sandstone cobblestones lined with clay. Due to these factors, this pit-house appears to be from the Basketmaker II period dating approximately 300 B.C. to 400 A.D. Very little is known of this period in the region. 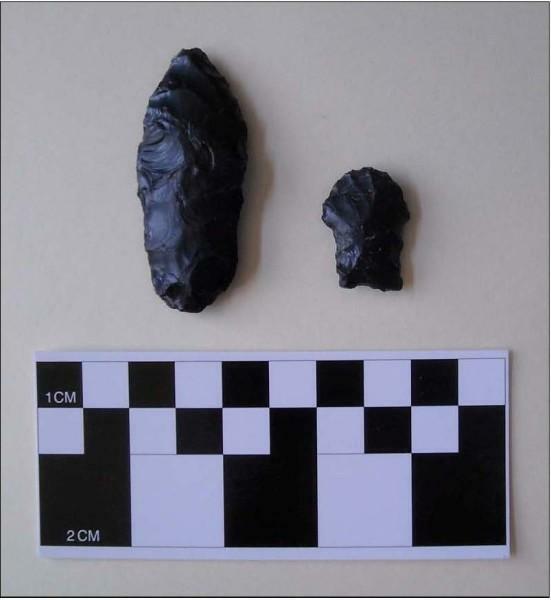 A “Lake Mojave” type stemmed spear point from a different site is indicative of the Paleoindian occupation. Researchers used “optically stimulated luminescence” testing to date the sediments where this was deposited. A “Bajada” type point was also recovered at this site suggesting a slightly later period. Several projectile points characteristic of the Archaic period have also been found in the area. Paleontological finds include dinosaur tracks of the early Jurassic Kayenta period along with a complete fish fossil and several plant fossils that are rare from that formation. Fossilized dinosaur teeth were also recovered representing nine different types, including three not previously described. The project has gained regional attention among archaeologists because it has contributed to the Basketmaker II period for this particular area and provides more possibilities and questions for researchers of this specific period. Utah’s prehistory, according to the Utah State Historic Preservation Society, has led to some interesting finds over the years. The oldest findings that have been excavated point to people that thrived in Utah more than 10,000 years ago, right after the ice age ended. The Paleoindians lived here along with camels, sloths, mammoths, giant bison and other extinct animals. Their cave remains surround the Great Salt Lake. As the climate warmed 8,000 years ago lifestyles shifted and archaeologists call the culture of this era the Archaic people. They were hunter-gatherers and basket makers who hunted with spears and other weapons they made. Their rock art is what has been discovered of them. Then, 2,000 years ago, things shifted once again when farming beans, corn and squash was discovered, from which evolved two broad cultures: Anasazi and the Fremont people. Archaeologists have discovered pit houses, moccasins and remnants of pottery, and know that by A.D. 750 both Fremont and Anasazi had created new weaponry: bows and arrows. Thereafter, 800 years ago, the Anasazi left Southern Utah and the Fremonts disappeared. There is a lot of speculation surrounding this. The next people to pop up were Numic-speaking people that evolved into four groups: Northern Shoshone, Goshute, Southern Paiute and Utes. By A.D. 1500 Navajos also moved in. The most recent group of people to move in were the euro-Americans, explorers, trappers, traders and settlers. The discovery and scientific dismantling of sites typically starts with a surface survey of the area, he said, the digging of trenches and then branching out with hand tools from there. Special survey equipment records various points of reference so items can be catalogued in context and the site data can be reproduced electronically for future reference and coordinated with artifacts in the laboratory. Kitchen said that paleontological finds were investigated by an expert who has researched other areas in Washington County where dinosaur tracks have been found and has worked for the local museum. The Southern Parkway has been realigned seven times through the environmental and design processes due to many factors, archaeology among the reasons. However, due to a proactive environmental approach, archaeological work has not posed any significant construction delay with potentially associated costs on the Southern Parkway. Kitchen said the contract specifications are also set up in a manner to keep construction active elsewhere on the project if UDOT does encounter something unexpected. Ed. Note: The roles of archaeologists and paleontologists involved in the described project while complementary have distinct scientific roles. As concerns fossils and the like, it is the work of paleontologists. As concerns dwellings and items used by people, it is the work of archaeologists. While there is interplay between the sciences involved in the subject of this report, Andrew Milner, paleontologist on the project, said that dinosaurs and people did not live together. Clarification added by update 11:19 p.m. Interesting find! I’m glad they are using a bit of care in this construction. That being said, I hope that UDOT is correct in being able to work around this, and other sites, without it pushing the project back many years, and many millions of dollars. Agreed, what a neat find! Interesting photos with the story, too. Quick! Somebody claim them as Lamanite or Nephite civilizations! I believe these people to have been an Ammonite civilization. The Ammonites (sons of Ammon) according to the Bible originated because of an incestuous relationship between Lot (Abraham’s nephew) and his younger daughter (Gen 19:38). Archaeology reveals that the Ammonites dwelt east of the Jordan River and settled there at the beginning of the 13th century B.C. The invertebrate was actually my intended meaning. Apparently my pun was too subtle. That was actually my intended meaning, but you seem to have missed the pun. UDOT also destroyed a huge section of the ruins and there’s no mention of this at all. For the record, these ruins were mostly all buried and not known before being discovered. UDOT hasnt just intentionally bulldozed known ruins. However, I see no reason for them to not slow down and take care to respect them. That Southern Parkway route is a ghost town and will be fore a decade or so. Those new smooth roads ALLEGEDLY make for some great weekend drag-races. Exactly. The claim that UDOT “destroyed” them is totally unsubstantiated. I admire the fact that they’ve now slowed down to prevent damaging them. Some construction goons wouldn’t have even thought twice. Nice to see the beltway getting worked on after all this time of stagnance out there. Well written and interesting article. Nice work Sarah. Are you available to tutor the mouth-breathers over at the Spectrum? YES! And the sooner, the better! While the road will go through a lot of “jackrabbit country,” it will also divert a huge amount of traffic from So. Cal, going to Zion, off of the I-15 corridor through St. George. It is badly needed, whether people realize it or not. Every metro area has a beltway, Sgnative. Nice to see work on it now before it’s too late and actually have gridlock. So you are saying they built the parkway to direct tourist traffic away from existing businesses and commercial centers? Ridiculous. Plus the parkway won’t be any quicker to east Hurricane than I15. The southern parkway will have a role someday but that role will not be significant for many years. It will be a useful regional route once something exists in its vicinity. For the time being it will simply be a second route for getting to the lone and dreary airport. I’d say the lines at cafe Rio are long enough (joke) lol. I see your point but I think it will pan out since as you also mentioned i15 will still be quicker. Wow a Lamanite find. I wonder if general Zelph lived here once. Cool story. I knew Utah had much deeper and much richer history than just white mormonism. Yep, US DOT is going to prove The Church of Jesus Christ of Latter-Day Saints wrong. They have the brains so many others, have not! Even a smart fella like yourself, couldn’t do it without them. No evidence that the site is 10,000 years old. Pure speculation and seems to be written in the hopes to get web hits. I find it so disgusting to see so many comments on here that arepositive mental and name calling. Are you people really all this unhappy with your own life that you have to constantly bag on others. Do something productive for once and contribute to society with positive service to a cause you believe in and stop spreading negative energy around like free candy. Strang, head over to the Spectrum. You are their target audience. No big words. The discovery is amazing! We are surrounded by many hidden treasures. Let’s do all we can to preserve them. This find is much more important than people may realize. First, Hunter Gatherers don’t tend to build permanent structures out of stone. They are nomadic, that is, they follow game and tend not to invest time and energy in quarrying stone and in carefully constructing a permanent site, even for ceremonial reasons. This is what makes Gobekli Tepe in Turkey so important. Carbon dating and luminescence dating there places that site firmly at 12000 B.C., many thousands of years before any megalithic construction should have been going on, according to orthodox Archaeology. Gunung Padang in Java, Indonesia is another example wherein evidence of habitation and dates for construction are exceeding 22,000 years B.C. and is rewriting history books as we speak!…. Geologists need to get down there to the UDOT site and date the layers of sedimentation over the structures immediately. Carbon dating needs to be done on organic matter found at the layers of the stone pavers. Luminescence dating needs to be done on the stone paver samples before they are uncovered and exposed to light. If the dates indicate a time frame at or near the end of the Pleistocene Epoch (10,500 B.C. ), it will mean that sophisticated human beings were occupying the area before the end of the last Ice Age.This is extremely significant, as it will be yet another site rewriting the orthodox archaeological timeline and narrative for the character and nature of the beginnings of human civilization on this continent. Great care needs to be taken to preserve every square inch of the site for study. This is HUGE!